Ready for the bachelorette party? 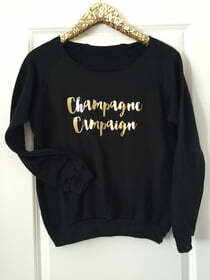 Don't forget to bring fleece sweatshirts along for your champagne campaign! This snuggly sweatshirt is ideal for chilly evenings when you've got to nab that last round before everyone crashes for the night! Choose another Champagne Lovers saying from the PHRASES page or customize!